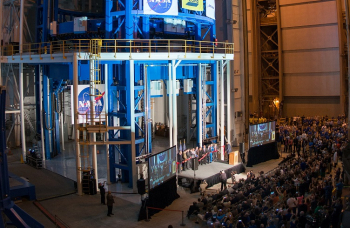 The Michoud Assembly Facility (MAF) is continuing its lengthy transition towards its new flagship role, marked by ribbon cutting event on Friday for a huge tool that will help construct the core stage of the Space Launch System (SLS). Known as the Vertical Assembly Center (VAC), the tool is the centerpiece of the new era for the New Orleans facility. It’s been a long road back for the huge factory in Louisiana. 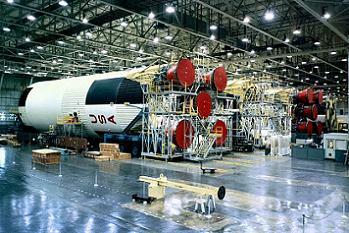 Following a famed history that included the production of stages for the giant Saturn V, transitioned to the construction of the External Tanks for the Space Shuttle Program (SSP), its future looked bleak when the Constellation Program (CxP) was cancelled. With most of its workforce made redundant, the facility’s large expanses became the set for several Hollywood movies – a depressing situation, as the former home of space hardware such as ET-132 became the set for GI Joe 2. Shoots of recovery – one that involves commercial and government work – have slowly come to fruition, such as the opening work on the first space bound Orion (EFT-1) and the ongoing construction of SNC’s space-worthy Dream Chaser. However, it’s the Space Launch System (SLS) that will return the hustle and bustle to Michoud, as the facility gears up with an array of extraordinary tooling that will result in huge stages – complete with their four RS-25 engines – rolling out of the factory doors. The project to transition MAF into the birthplace of the SLS stages is huge. It involves construction projects in Buildings 103, 110, 114, 115, 131 and 451 – along with modifications in numerous other areas inside the facility’s 42 acres. 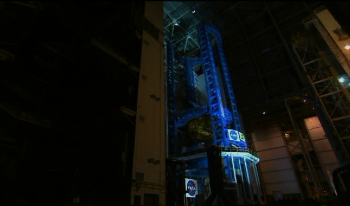 Even the roof has been extended in areas to allow for sheer size of SLS stages. A big rocket requires big tooling, and that is no exception for the VAC. Coming in at 170-foot-tall and 78-foot-wide, the giant structure completes a world-class welding toolkit for Michoud. Officially opened during Friday’s ribbon cutting ceremony, the VAC will undergo validation testing, ahead of work on several large structures that have already been prepared nearby. Engineers recently completed welding all the rings for the first flight of SLS using the Segmented Ring Tool, while ten barrels also have been welded for the SLS core stage using the Vertical Weld Center. The Segmented Ring Tool use a friction-stir-weld process to produce segmented support rings for the SLS core stage. 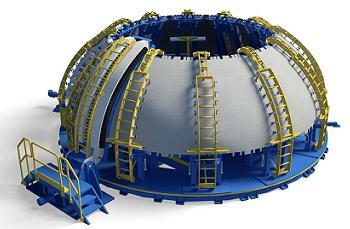 The rings connect and provide stiffness between domes and barrels. Meanwhile, the Vertical Weld Center – a friction-stir-weld tool for wet and dry structures on the SLS core stage – welds barrel panels together to produce whole barrels for the two pressurized tanks, the Intertank, the Forward Skirt and the Aft Engine Section. Once in full flow, numerous tools will work together in a production line scenario, that includes the Robotic Weld Tool – with the Circumferential Dome Weld and Gore Weld tools – used to make dome components for SLS. This machine will be known as the Enhanced Robotic Weld Tool when in full operation. Specifically, the Circumferential Dome Weld Tool’s role is to perform circumferential friction stir welds in the production of dome assemblies for the SLS core stage cryogenic tanks. The Gore Weld Tool will perform vertical conventional friction stir welds in the production of gore assemblies – preformed aluminum alloy dome segments – for the SLS core stage tanks. 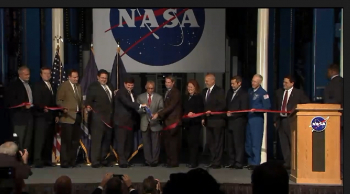 While the ribbon cutting event was surrounded by the usual political sound bytes about going to Mars – despite such an aspiration being undefined, it follows closely after the SLS team received approval to proceed to the Critical Design Review (CDR) stage for the big rocket. 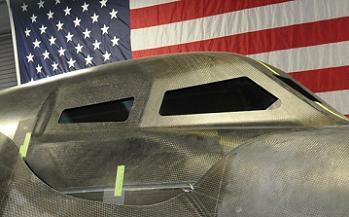 “The SLS Program continues to make significant progress. The core stage and boosters have both completed critical design review, and NASA recently approved the SLS Program’s progression from formulation to development,” noted Todd May, SLS program manager.